A tree with large compound leaves and about 16 pairs of leaflets per leaf, often deciduous or semi-deciduous. 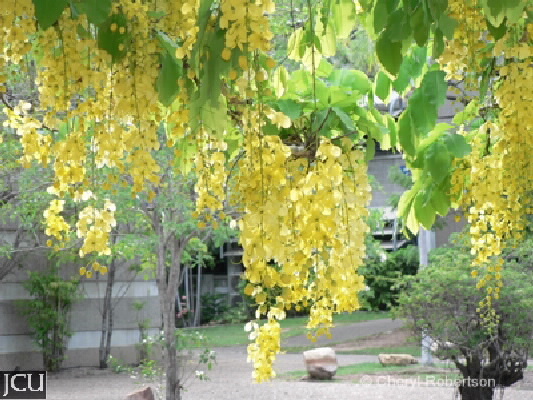 The yellow flowers are arranged in large pendulous sprays and the cylindrical seed pods often exceed 30 cm long. Some old pods can be found hanging on the tree at most times of the year. The seeds are arranged horizontally in the pod, which when broken open and smelt gives off a strong smell of cascara, this is sometimes used as a laxative. The pods, seeds and pulp between the seeds should not be eaten. Good wind resistance.